Based on mathematical models of immunocomputing, this chapter describes an approach to spatio-temporal forecast (STF) by intelligent signal processing. The approach includes both low-level feature extraction and highlevel (“intelligent”) pattern recognition. The key model is the formal immune network (FIN) including apoptosis (programmed cell death) and immunization both controlled by cytokines (messenger proteins). Such FIN can be formed from raw signal using discrete tree transform (DTT), singular value decomposition (SVD), and the proposed index of inseparability in comparison with the Renyi entropy. Real-world application is demonstrated on data of space monitoring of the Caspian, Black, and Barents Sea. A surprising result is strong negative correlation between anomalies of sea surface temperature (SST) and sunspot number (SSN). This effect can be utilized for long-term STF. 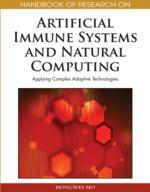 Artificial immune systems (AISs) (Dasgupta 1999; de Castro & Timmis 2002) and immunocomputing (IC) (Tarakanov et al. 2003; Zhao 2005) are developing with the branches of computational intelligence (Tarakanov & Nicosia 2007; Dasgupta & Nino 2008; Tarakanov 2008) like genetic algorithms (Tarakanov A. & Tarakanov Y. 2005) and artificial neural networks (ANNs) also called neurocomputing (Tarakanov A. & Tarakanov Y. 2004). Recent advances in AISs include a stochastic model of immune response (Chao et al. 2004), an aircraft fault detection (Dasgupta et al. 2004), intrusion detection (Dasgupta & Gonzalez 2005) and computational models based on the negative selection process that occurs in the thymus (Dasgupta 2006; Dasgupta & Nino 2008). Recent advances in IC include a concept of biomolecular immunocomputer as a computer controlled fragment of the natural immune system (Goncharova et al. 2005). A connection of IC with brain research leads to promising results in understanding of basic principles of organization of molecular networks and receptor mosaics which are common for the brain and immunity (Agnati et al. 2005ab, 2008; Goncharova & Tarakanov 2007, 2008b). A connection of IC with cellular automata (CA) (Adamatzky 1994) leads to encouraging results in three-dimensional (3D) computer graphics (Tarakanov and Adamatzky 2002) and inspires a novel method of identification of CA (Tarakanov & Prokaev 2007). Recent advances in real-world applications of the IC (Tarakanov 2007a) include signal processing and intrusion detection (Atreas et al. 2003, 2004; Tarakanov et al. 2005b, 2007a) as well as intelligent simulation of hydro-physical fields (Tarakanov et al. 2007bc). In such general perspective, the objective of this chapter is to develop the IC approach to spatio-temporal forecast (STF) by intelligent signal processing. According to (Cheng & Wang 2007), STF can be considered as data mining or the extraction of unknown and implicit knowledge, structures, spatio-temporal relationships, or patterns not explicitly stored in spatio-temporal data. In this chapter, the IC approach is applied to real-world data of space monitoring of the Caspian, Black, and Barents Sea (NASA 2007). A surprising and controversial result of this application is rather strong negative correlation between anomalies of sea surface temperature (SST) and an index of solar activity – sunspot number (SSN). This effect may be utilized for long-term STF. Discrete Tree Transform (DTT): Mapping of signal to the tree structure. Immunocomputing (IC): Mathematical models of information processing by proteins and immune networks. Singular Value Decomposition (SVD): Matrix decomposition by singular values and singular vectors. Formal Immune Network (FIN): Mathematical model of information processing by natural immune network. Immunization: Training of immune network. Spatio-Temporal Forecast (STF): Prediction of values of a parameter (e.g. sea surface temperature) over time and/or space. Cytokines: Messenger proteins that provide intercellular communication within the immune system.